The Lady Eve's Reel Life: ...aka/'Ann Newton' of "Shadow of a Doubt"
...aka/'Ann Newton' of "Shadow of a Doubt"
Edna May was nine years old and living with her family in Santa Rosa, California, when she caught the eye of director Alfred Hitchcock while he was in town preparing to make Shadow of a Doubt (1943). The director cast her in the role of Ann Newton, younger sister of the protagonist, Charlie Newton (Teresa Wright) and niece of the villain, Charles Oakley (Joseph Cotten). Edna May made quite a splash in the part and appeared in small roles in other films over the next few years. "I was discovered in Santa Rosa, standing on a street corner waiting for a bus. 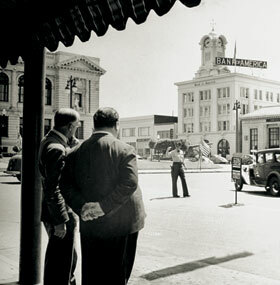 Alfred Hitchcock and producer Jack Skirball were standing at the same corner looking over the town." That particular corner bus stop, in front of a Karl's shoe store, had a view of several prominent downtown locations including the courthouse, a circular green and the bank. Hitchcock and Skirball were looking and talking and jotting down notes on a clipboard. Edna May watched them and was curious. She edged away from her cousins to be closer to Hitchcock and Skirball so she could find out what was going on. The two men noticed her observing them and began to look her over. "My older cousin made me move away from them and next to her, and the two men kept looking at me and finally walked over to us and introduced themselves and said they were making a movie in town and wanted to know if I wanted to be in it." They asked for her address and said they would be out to talk to her parents that afternoon. Edna May ran all the way home to tell her mother that she was going to be in a movie. Her mother, well aware of her daughter's vivid imagination, thought she'd made it up until the cousins arrived and confirmed her story. The next day Edna May and her mother were on the night train to Los Angeles where the young girl would make her screen test. The following morning they taxied from the Glendale depot to Universal Studios, where they were met at the gate and escorted to the audition. Edna May was given a script for the phone scene, the first appearance of Ann Newton in Shadow of a Doubt. Hitchcock directed her, basically instructing her on the reactions and expressions he was after. Edna May wasn't nervous, she just followed Hitchcock's direction and aced the screen test. She said she didn't have to be coaxed into taking the part, adding: "What nine year old wouldn't want to be in a movie?" The story goes - and it's true - that Edna May had no experience as a performer up to that point, not even in school plays or church pageants, "I hadn't had any acting experience and no interest in ever doing such a thing..."
While at Universal, Edna May and her mother ate in the commissary and were entranced as they watched actors and actresses in costume eating lunch. Edna remembers meeting Abbott and Costello, Deanna Durbin and Shemp Howard of Three Stooges fame that day. In fact, she and her mother were offered an all-expenses-paid weekend in Hollywood, including a chauffeur-driven car to take them anywhere they'd like to go. Edna May wanted more than anything to visit the Disney studios, but her mother, unsettled at being away from home and on her own for the first time, didn't want to stay - and they were on the train headed back to Santa Rosa that night. Though she was a novice, Edna May didn't receive any special training for her performance. She gives credit to the director: "I had no coaching for the part and just took direction from Alfred Hitchcock." She worked well with him and had no trouble understanding what he wanted from her. She felt it was the same for the other actors in the cast (Joseph Cotten, Teresa Wright, Henry Travers, Patricia Collinge, Hume Cronyn, Macdonald Carey, Wallace Ford). She recalls Hitchcock as a very quiet man who kept to himself much of the time (she often saw him reading comic books on the set). 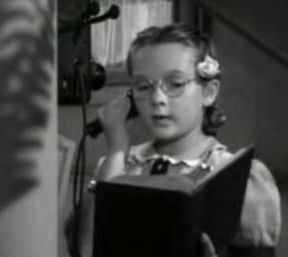 Ann Newton was a unique character, a confident, self-possessed little girl who loved books and didn't hesitate to speak up. She was an observant child, the only family member who took a dubious view of Uncle Charlie early on. I wondered if Edna May had been like Ann Newton as a child. In some ways, she doesn't think so ("I didn't like reading and would rather be outside riding my bike or playing."). 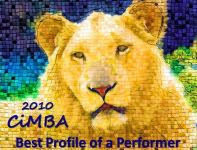 On the other hand, she noted that she was "a very confident kid and never doubted I could do anything I wanted to do." And she was observant; it was her curiosity about Hitchcock and Skirball on that street corner that set her Hollywood adventure in motion. Edna remembers filming Shadow of a Doubt fondly: "The cast and crew were like a happy family. No one was treated any differently than anyone else. I had no favorites on the set other than the fact that I was madly in love with Joseph Cotten and melted every time he talked to me. Everybody knew this and I got kidded a lot!" Her crush on the charismatic Mr. Cotten didn't get in the way of her performance, though. Hitchcock's instructions to Edna May regarding her scenes with Cotten were: "It doesn't matter how nice he is to you, always be suspicious of him and question why he's doing what he's doing." Ann's skepticism of him is reflected the moment Uncle Charlie hands her an ill-chosen teddy bear gift and Edna May screws up her face and gives him a withering sidelong glance. Shadow of a Doubt's exterior scenes were shot on location in Santa Rosa, which was unusual for the time. The interiors were shot at the studio on a soundstage. When the time came to travel to Hollywood again, Edna May's mother and brother accompanied her. Her dad, who was a Santa Rosa grocer, stayed home and minded the store. It was her brother who helped her memorize her lines. Filming on Shadow of a Doubt began in August 1942 and took three months to complete. While in Hollywood during the school year, Edna May was tutored on the set on the days that she worked. On off-days, she attended classes at the studio's schoolhouse. 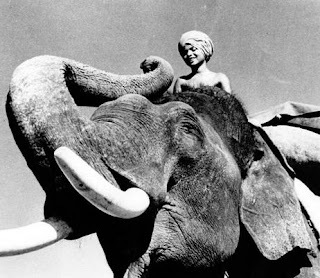 She particularly remembers one fellow student, Sabu, who captivated the class with stories about the elephants of India. His stories gave Edna May the impression that in India elephants were as common as dogs in the U.S., and treated in much the same way. Edna May became close to Pat Hitchcock, the director's daughter, and the two often played gin rummy on the set. Both girls had crushes on Joseph Cotten, and when he gave Edna May an autographed picture inscribed "with love," Edna remembers that Pat was a little disconcerted because Cotten hadn't signed his picture to her with the same sentiment. The Hitchcocks frequently took Edna May to Hollywood's famous Brown Derby restaurant with them, and she spent many weekends as Pat's guest at the Hitchcock home. 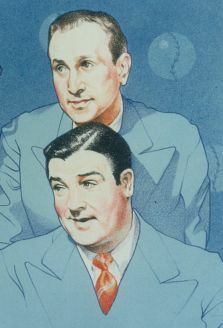 On most days, their meals would be ordered from the kitchen and sent up to Pat's room via a "dumb-waiter" built into the wall. One day, though, Pat told her there would be a formal dinner that evening and to "wear something nice." Edna May was flustered, not being familiar with the forks, spoons, knives, dishes and glasses used at proper dinners. She hoped to sit next to Pat and follow her lead. But Pat told her they'd be sitting across the table from each other and, when it came to the silverware, "just start from the outside and work your way in." It turned out that the evening's guests were Joseph Cotten, his wife and step-daughter - and Edna was seated next to him. She remembers being so smitten that she was trembling. And she'll never forget that he talked with her all through dinner. Like so many kids of that era, Edna May had an autograph book. When it was Alfred Hitchcock's turn to sign, he did it as one might expect - with a twist. He signed the last page in the book and with his left hand (he was right-handed): "By hook or by crook, I'll be the last one to sign in this book." At the end of the shoot, there was a goodbye party in San Francisco. Edna May received many gifts that she still cherishes, including an inscribed bracelet from Teresa Wright, a scarf with a "pigtail" motif from Joseph Cotten and a golden bow from Hitchcock inscribed "to Ann Newton from Alfred Hitchcock." Edna recalls that Hitchcock never called her anything but Ann throughout the making of Shadow of a Doubt. Edna May, of course, was a local celebrity in Santa Rosa (then with a population of 19,000). "There was a lot of publicity and women would come into dad's store and want to touch the father of a movie star! I have lots of scrapbooks of the publicity and had quite a write-up in Life magazine and was in movie magazines. 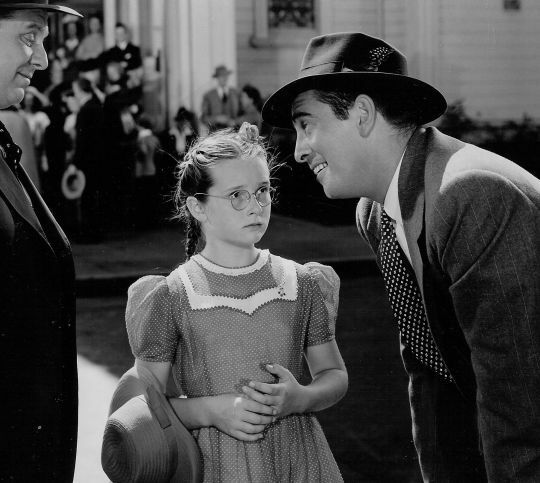 Little girls with pigtails and glasses suddenly started showing up on the street corners in town." When Shadow of a Doubt was released it premiered in Santa Rosa and Pat Hitchcock came up from Hollywood and attended with Edna May. There was quite a hubbub in town over the film and its release signaled a war bond drive, with Edna May kicking it off at the courthouse in Santa Rosa. She also took a trip to sell war bonds in Salinas when the movie opened there. When she signed a five-year contract with producer Jack Skirball, Edna May and her parents moved to Glendale following the release of Shadow of a Doubt. Her older brother, then in college, stayed in Santa Rosa and ran the family store until he went into the military and served during World War II. Her first assignment for Skirball was to be It's in the Bag with Fred Allen, and Edna May was to have equal billing. But Allen balked at this and refused to work with her. Ultimately, her contract was broken, but when the film was eventually made without her, Edna May was paid in full. At this point, she signed with an agent who handled child actors exclusively. Edna May won small roles in several more films, and she has warm memories of working on Leo McCarey's The Bells of Saint Mary's (1945), a film nominated for eight Oscars and winner of one. 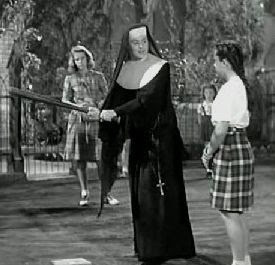 She played Delphine, a girl about to graduate from St. Mary's, the one who smacks a baseball through a window in Mr. Bogardus's (Henry Travers) new building. Edna recalls that, like Shadow of a Doubt, the atmosphere on the set was "just like family." Ingrid Bergman was "a real sweetheart who said hello to everyone from the janitor on up when she came on the set." Edna also remembers that a member of the crew would play a little tune on an ocarina whenever Miss Bergman arrived. She adds, "We had a lot of fun with Bing Crosby - since there was a schoolyard set, he was always playing basketball with the kids." Edna continued playing bit parts for the next few years but left acting at the beginning of the 1950s. Though her movie career is now long ago, she remembers those days with pleasure, "I have nothing but good memories of working in Hollywood. It was a different era than it is now and, being as young as I was, I didn't feel like an actress...I was just a kid who did what she was told to do." Along with her memories, Edna has a treasure-trove of Shadow of a Doubt memorabilia. From her scrapbooks, copies of Life magazine and the prized goodbye gifts, to her original script with its cover signed by Hitchcock and the entire cast. Edna mused that some friends of hers recently watched Shadow of a Doubt after she told them she was in it. They were quick to tell her: "You are just exactly like you were in that movie." And I'll admit that at times during our conversation I could hear a little bit of Ann Newton as I spoke with Edna Green. Click here for MedusaMorlock's post about Edna; click here for an update on Edna's life a year after our first interview, click here to view publicity photos from Edna's personal collection. Click here to watch a 2012 TV interview with Edna (courtesy of KPIX TV, San Francisco). Terrific article. Edna May was so good in "Shadow", one of my favorite movies. Thanks, Jacqueline. 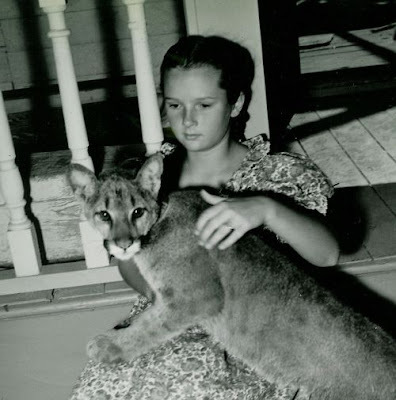 'Ann Newton' was the opportunity of a lifetime for Edna. She remarked to me that no one involved in the making of the film back in 1942/43 had any idea people would be talking about it for years after - let alone 70 yrs. later. Appearing in one of the great Hitchcock classics bestows a kind of film immortality. I love this! Great article! I really enjoyed reading about all her memories and how the cast acted like a family. Teresa W. and Jo Cotton sound as sweet as I imagine them :) Edna May sounds like a wonderful woman as well. Thanks. It was marvelous reading about Edna/Ann. "Ann" is an immortal movie character. A little girl in the movies that it is easy to relate to. Incredibly blog! I remember reading much of this a few months back, but it is a pleasure to return to your interview of Ms. Edna May. There is a lot of interesting things you were able to discuss! She really stole the show in Shadow of a Doubt. Loved learning more about her. Thanks for sharing. How interesting LadyEve! This really was a case of being at the right place at the right time. And of course Ann had what it took. I remember my mother traipsing me over to one child acting part or another in Hollywood - but I didn't get any of them. But then I'm sure I didn't have what it took. That's great that you were able to track her down and record these memories. JNP - Edna is an amazing woman. She'll be 80 next Feb., which is hard to believe, knowing how active she is. She really did have glowing praise for Teresa Wright and Joseph Cotten - and seems to have been intrigued by Hitchcock. CaftanWoman - I'd always thought of 'Ann Newton' as one of the more interesting young characters in movies - quirky but likable. It's been great to get to know the person who brought 'Ann' to life. Brandon - Happy 20th birthday, by the way...Edna really did hold her own with some great pros in "Shadow of a Doubt" and created a memorable character (one of several in the film), too. Christian - There is a bit of synchronicity in Edna's tale, isn't there? It fascinates me that one day she was waiting for a bus in Santa Rosa and two days later she was auditioning in Hollywood. Whatever your shortcomings as an actor may have been, you've got what it takes as a writer and historian. wow!! that is a s**tload of information and all from "the horse's mouth"...good work EVE...masterfully done!! !...this needs to be published....10X better than the crap I usually read!! What a wonderful article and opportunity to read about someone who worked on this marvelous film. Thank you,Lady Eve - this is really special! Eve, it's nice to know she has had a happy life and can look back with fond memories. That is quite a nice collection of photos she has in her collection. It was nice of her to share. A truly wonderful article! FlickChick - Edna is the only remaining featured player of the "Shadow of a Doubt" cast - which made preserving her recollections especially meaningful to me. John - My favorites of Edna's photos are: the one of her with Hitchcock with the script on the table in front of them, the one with her dad at the family store and the one of her with her mom and dad. Very happy Edna's story was enjoyable for you both (and all who've stopped by and commented). 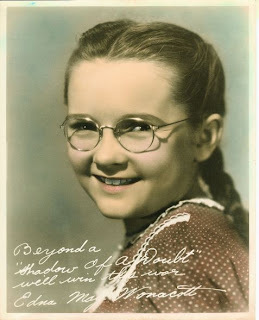 Eve, I thoroughly enjoyed your interview with Edna May Wonacott about SHADOW OF A DOUBT and her brief but fruitful experiences as a child star! It sounds like Edna was perfect casting as Ann Newton, which surely made it that much easier to work with Hitchcock. :-) Your anecdotes about Edna and Pat Hitchcock had me smiling. I also followed the link to your SHADOW OF A DOUBT review; it was another one of your terrific posts, and both those posts made for a great double-feature read! Hi, Dorian, & Thanks! Hitchcock certainly had an eye for casting his pictures didn't he? I love Edna's story, she's lived quite a life and is still going strong at nearly 80 (next Feb.). I've been meaning to get back to you on this fine article on Edna. With all the volumes written on Hitchcock, I've never come across any that offered information on what ever became of that uniquely mature little girl! Hers is a wonderful story and you coverage is informative and entertaining. Thanks for calling it to my attention! Ken - I'm hoping one day TCM includes Edna May in one of its round-ups of child stars. Or in connection with some Hitchcock tribute. Loved the film SOAD, and greatly enjoyed your article about Edna May. Imagine, just being sighted across the street and your picked to be in a film! Jenni - It happens almost never, but it happened to Edna 70+ years ago. Thanks for stopping by. Wow, fantastic post! I love Shadow of a Doubt and love Edna May's performance in it, but I never knew the history of how she got the role. She sounds like a lovely woman who truly appreciates and reflects fondly on the experiences that she had while making films. Thanks! Edna, despite spending a good amount of her youth in Hollywood, managed to lead a fairly normal life. But she does cherish her memories - and mementos - of movie making. Great post! Edna is one of the best parts of "Shadow of a Doubt". She seems so natural on screen. This must have been a terrific interview. We can tell by the interesting bits of information and the stories you were able to glean from her. I've always loved the Ann Newton character in "SoaD," so to get to know the actress who portrayed her has been exciting and a lot of fun. Last year Edna was interviewed by San Francisco's CBS affiliate as part of a news feature on Hitchcock in the SF Bay Area (he had a ranch up here and shot parts of "Vertigo," "The Birds," a bit of "Rebecca," along with "SoaD" in the vicinity). It was the first time she was in the news in her hometown area since the 1940s. Fabulous post ,so full of fascinating information from Edna May. I think we all agree her performance in Shadow of a Doubt is terrific. Has she never been interviewed by Robert Osborne for TCM? Vienna, Edna hasn't been interviewed by Robert Osborne or anyone from TCM. I'm a little surprised because her story has been making its way from blog to newspaper to magazine to local TV over the past few years. Hoping TCM discovers her someday soon. Wonderful and terrific read!! I'm pea green with envy that you got to interview her and love all the memories you note she shared with you AND the fact she keeps those mementos from her time in Hollywood. A sweet Hollywood story. I was so tempted to reach out to the subject of my post for this blogathon, George Winslow for an interview to (hopefully) get some fun stories of his working with Marilyn Monroe and Cary Grant, but I didn't. I did search for his contact information, tho. Anyway - I'm always happy to visit your REEL LIFE!! Aurora, I didn't have any trouble locating Edna. I contacted her by letter & included my phone & email so she could easily reach me if she was interested. Thankfully, she was. I'd encourage you to reach out to George Winslow even now - why not? I've been trying to track down Tommy Kirk who reportedly lives somewhere in my area. Would love to talk with him about his Disney years. Very good article. Edna was a lucky girl, having such a rich experience as a child, and certinaly lots of stories to tell. Sometimes I get pissed by Ann Newton, but maybe it's because I'm a little like her, a bookworm. Le, Ann Newton, with her book-ish ways and set opinions, seemed to annoy her family at times, too. But it's a great and very unique role, and Edna was lucky to have won it. Thanks so much for the fascinating article! "Shadow of a Doubt" is one of my favorite Hitchcock films and Edna May was such a bright little character in the film. Thanks for sharing her memories! "Shadow of a Doubt" is one of my very favorite Hitchcock films, too - thank you! This is such a wonderful post! Good move to track down Edna May. She is quite the story teller. I can just picture her checking out the stars while eating lunch. What a fun visual. KC, Can you imagine being nine years old and suddenly finding yourself in the wonderland of a Hollywood studio commissary? Edna still sounded delighted by the experience when she told me about it many, many years later. Finally getting around to checking on the other Children in Film Blogathon submission to Comet Over Hollywood. Great post and insights; always lover Hitchcock-related stories! Intersting Article.It was marvelous reading about Edna/Ann.Appearing in one of the great Hitchcock classics bestows a kind of film immortality.Teresa W. and Jo Cotton sound as sweet as I imagine them :) Edna May sounds like a wonderful woman as well.